A track record of getting the job done. W.F. 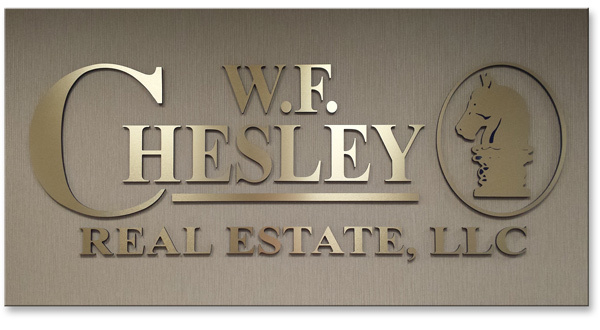 Chesley Real Estate has represented hundreds of notable projects in the greater Washington-Baltimore metropolitan area. Whether you are renewing a lease, searching for space or have a building to sell, our associates will get the job done professionally and efficiently while keeping your goals, objectives and timetable in mind. Professional Records Storage, a large regional office records storage company. Professional Records Storage had grown rapidly and was seeking expanded facilities with very tight economic terms. They had specialized size and height requirements. At first look, no existing facility met the client’s needs. We undertook to place the client as a lead tenant in the redevelopment of a large vacated industrial site. The objective was to blend very low rent with modern, accessible space. We negotiated a lease with rents at approximately 30 percent of the then-market and improvements. The improvements included raising the roof of a 400,000 sq. ft. building from 22’ to 32’ ceiling height to accommodate our client. The client established its regional headquarters in a totally reconditioned facility at substantially below market rents and with a ceiling height that permitted racking to 28’. These economic terms permitted the client to acquire more space than its current needs thus allowing for substantial growth. First Baptist Church of Glenarden is a large Baptist church that has grown from approximately 300 members to well over 12,000 members in less than 20 years. We first represented the church in the acquisition of a vacant Hechinger store and warehouse (approximately 60,000 sq. ft.) and assisted in permitting to convert the facilities to a location for the church. Membership promptly outgrew the new location. We conducted a search over many months to acquire adequate property for the construction of a new facility. Ultimately, we negotiated and acquired on behalf of the church, three different adjoining parcels of land totaling approximately 160 acres. We also assisted throughout the permitting process to secure approval in a residential neighborhood for a large, new campus. First Baptist Church of Glenarden now worships in a new $60 million facility, while continuing to operate administrative offices, a school and many other programs in its original site. The Bozzuto Group, a regional real estate developer actively engaged in single and multifamily housing, property management, construction and other phases of development activity. Client had several leases in different locations and with different expiration dates. We negotiated a single lease accommodating all of Client’s needs in a brand new building, substantially enhancing operational ease and with a net reduction of cost. The negotiations included a complete, custom turn-key build out of 70,000 sq. ft. of space, and the Landlord’s assumption of the client’s lease obligation for all existing leases through their expiration dates. Client consolidated all of its space requirements into a single, corporate headquarters location, without incurring any obligation or continued liability under its previously existing leases. We also facilitated all necessary permitting in order for the client to move into its new location on schedule.